German commuter and knitter Claudia Weber travels to Munich regularly from her town Moosburg in the Bavarian countryside. Due to track repairs which began last year, her train commute was replaced with a bus service that would often be delayed for up to 30 minutes or longer. Weber decided to start detailing her daily travel troubles by translating the delays into a wool scarf. Each evening after she returned home she would add two new rows to her textile work— gray for any delay under five minutes, pink for when she had to wait up to 30 minutes, and bright red for a delay that lasted more than a half hour or was in both directions. Agnes Denes, Tree Mountain—A Living Time Capsule—11,000 Trees, 11,000 People, 400 Years, 1992–96, Pinsiönkankaantie 10, 39150 Pinsiö. © Agnes Denes. (project 70, page 86) All images courtesy of Phaidon. When traveling, it is a given that I will visit at least one museum dedicated to art. Most often it is someplace new—either an institution that has previously escaped my radar, or one that belongs to a city I have not yet explored. Although I enjoy viewing institutional collections, I am perhaps most drawn to works installed outdoors, especially if they require a bit of extra effort to reach. Phaidon has taken the burden out of researching secluded works and well-known urban installations by compiling some of the best into a new compendium titled Destination Art. The book is a follow-up to their publication Destination Architecture (2017), and includes 500 artworks installed around the globe in 60 countries and 300 cities. The guide is a great resource for planning your next art pilgrimage to a far off corner of the Earth, or simply narrowing down a piece or two that have been hiding in your own backyard. The global guide is focused on site-specific modern and contemporary works from 340 artists ranging from Yayoi Kusama’s city-based collaboration with Coca-Cola in Matsumoto, Nagano in Japan to Louise Bourgeois’s “Crouching Spider” (2003) situated on a reflective pool outside the Château La Coste in Le Puy-Sainte-Réparade, France. You can buy the book, which includes a wide range of murals, sculptures, sound installations, land art, and more, on Amazon and Phaidon. A spread from Destination Art: 500 Artworks Worth the Trip, published by Phaidon. Grand Prize & 1st Place (Places). Photograph and caption by Jassen Todorov / 2018 National Geographic Photo Contest. Thousands of Volkswagen and Audi cars sit idle in the middle of California’s Mojave Desert. Models manufactured from 2009 to 2015 were designed to cheat emissions tests mandated by the U.S. Environmental Protection Agency. Following the scandal, Volkswagen recalled millions of cars. By capturing scenes like this one, I hope we will all become more conscious of and more caring toward our beautiful planet. A panel of National Geographic photo editors have chosen the winners of the 2018 National Geographic Photo Contest from a pool of over 10,000 entries. The grand prize winner, and top pick for the “Places” group is an aerial shot (above) by Jassen Todorov of a Volkswagen and Audi graveyard at the Southern California Logistics Airport in the Mojave Desert. The striking image shows a fraction of the 11 million cars that Volkswagen fitted with devices that could alter performance during emissions tests by the EPA. Todorov’s image uses a plane for scale to visually demonstrate a story of environmental issues. As the winner, Todorov earned $5000 and a feature on National Geographic’s Instagram. Submitted across three categories (People, Places, and Wildlife), the other winning images and honorable mentions span the globe in terms of content and photographers. To read more about each image, check out their respective captions below, and head over to the 2018 National Geographic Photo Contest website. 1st Place (People). Photograph and caption by Mia Collis / 2018 National Geographic Photo Contest. I was looking to do a series of portraits showing people wearing their Sunday best when I made this photo of David Muyochokera. It was taken on his last Sunday working as a photographer at Weekend Studio, in Kibera—a large shantytown in Nairobi, Kenya. My friend Peter, a local resident, had pointed me to the photo studio just as I was about to leave the area. It was a stunning space, with whimsical backdrops and natural light coming through the doorway. David had worked there for 37 years, but Weekend Studio was about to close permanently. Phone cameras were so common now, he said, and fewer people wanted studio portraits. David planned to retire and return home to the countryside. I was troubled by the studio’s imminent closure, so I eventually took over the rent. A portrait of David now hangs at Weekend Studio in his memory. 2nd Place (People). Photograph and caption by Todd Kennedy / 2018 National Geographic Photo Contest. On a family holiday driving from Sydney to Uluru, we stopped at a roadside motel in the small rural township of Nyngan, on the edge of Australia’s outback. The area is in the wheat belt, and it was unusually hot for that time of year—over a hundred degrees Fahrenheit and very dusty. Our daughter, Genie, is seen here enjoying a refreshing bath in a rubber ducky perched on the sink. 3rd Place (People). Photograph and caption by Avishek Das / 2018 National Geographic Photo Contest. A Hindu devotee kisses his newborn baby during the Charak Puja festival in West Bengal, India. Traditional practice calls for the devotee to be pierced with a hook and sometimes swung from a rope. This painful sacrifice is enacted to save their children from anxiety. While covering the festival, I was able to view the religious practice from the perspective of Hindu devotees. 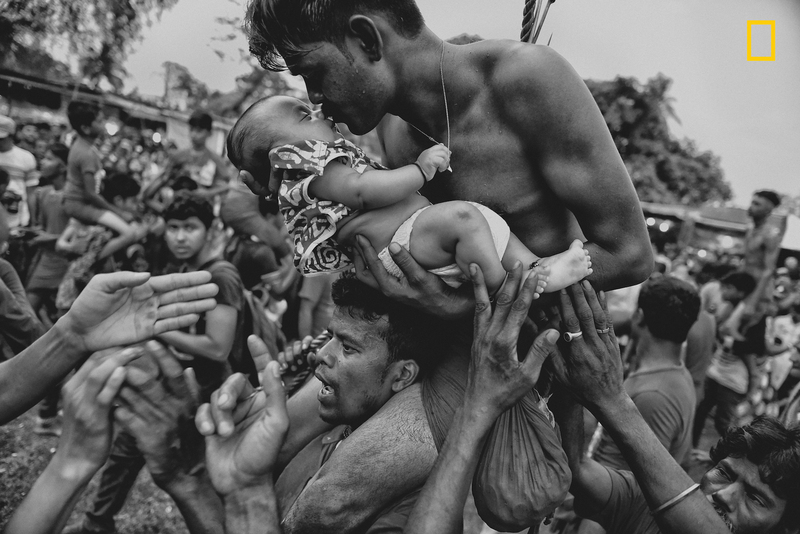 I tried to capture the moment of love and bonding between a father and his child—and show a father’s concern for his little son. 2nd Place (Places). Photograph and caption by Nicholas Moir / 2018 National Geographic Photo Contest. A rusting Ford Thunderbird is blanketed by red dust from a supercell thunderstorm in Ralls, Texas. The dry, plowed fields of the Texas Panhandle made easy prey for the storm, which had winds over 90 miles an hour ripping up the topsoil and depositing it farther south. I was forecasting and positioning a team of videographers and photographers on a storm chase in Tornado Alley—this was our last day of a very successful chase, having witnessed 16 tornadoes over 10 days. The target area for a storm initiation was just south of Amarillo, Texas. Once the storm became a supercell, it moved southbound with outflow winds that were easily strong enough to tear up the topsoil and send it into the air. 3rd Place (Places). Photograph and caption by Christian Werner / 2018 National Geographic Photo Contest. While on assignment for Der Spiegel, we made a road trip through Syria to document the current situation in major cities. When I first entered the Khalidiya district in Homs, I was shocked. I hadn’t seen such large-scale destruction before, and I had been to many destroyed cities. The area around the Khalidiya district was extremely quiet. No city sounds, cars—nothing. Only the chirping of swallows and the wind. We walked down the streets of Khalidiya, but the destruction was so large scale that you couldn’t have the big picture from the point of view on the street—you could only manage it with a view from above. To make this image, I asked a Syrian soldier in charge of the area if I could climb onto a ruin. The soldier agreed, allowing me to climb at my own risk. I climbed up the ruins of a former house—which was full of improvised explosive devices—and took the picture. I was very lucky to take the picture when I was on the rooftop. Without any sign of life, it would have been a dead picture. I can recall the memory vividly. Honorable mention (Places). Photograph and caption by Rucca Y Ito / 2018 National Geographic Photo Contest. Japan’s Blue Pond in Biei-cho, Hokkaido, has become very famous for attracting tourists from around the world. It is surrounded by beautiful mountains and trees. This pond, frozen during winter, was artificially made to prevent river contamination from the nearby active volcano, Mount Tokachi. The accumulated pond water contains high levels of minerals, such as those containing aluminum. The alluring view of the blue pond can take one’s breath away. To make this image, I made the exposure longer to capture the way the snow was falling. At the same time, I lit up the strobe for a moment to capture the snowflakes that are reflecting in the foreground. I took as many photos as I could and chose the one I thought had the best balance of the falling snow and the unfocused snowflakes. I wanted to express how time is created in just one moment and, by tying together these moments, history is made. 1st Place (Wildlife). Photograph and caption by Pim Volkers / 2018 National Geographic Photo Contest. It was early morning when I saw the wildebeests crossing Tanzania’s Mara River. The layering of dust, shade, and sun over the chaos of wildebeests kicking up water gives this picture a sense of mystique and allure. It’s almost like an old painting—I’m still compelled to search the detail of the image to absorb the unreal scene. 2nd Place (Wildlife). Photograph and caption by Jonas Beyer / 2018 National Geographic Photo Contest. A few miles from Qaanaaq (Thule), Greenland, I was on a hike in search of musk oxen when I came upon a group of them. This ox was running on a hillside in deep snow, which exploded underneath it—an amazing sight. The photo came together in a few seconds. I was lucky enough to be at the right spot to observe them frolicking, and then I had the incredible experience of watching them closely for about an hour. I love photographing musk oxen against the wintry landscape: They’re extremely tough Arctic survivors. This photo shows their beauty and their power—and the snow they deal with for about eight months of the year. 3rd Place (Wildlife). Photograph and caption by Alison Langevad / 2018 National Geographic Photo Contest. As the late-night hours ticked by and my eyelids grew heavy, two southern white rhinoceroses appeared silently from the shadows to drink from a watering hole in South Africa’s Zimanga Game Reserve. On alert, they stood back to back, observing their surroundings before lowering their heads. I felt privileged to share this moment with these endangered animals. While I was well prepared technically, with my camera set correctly on a tripod, I underestimated the emotional impact the magnificent beasts would have on me. I had photographed them months earlier, and now both rhinos sported a new look: They had been dehorned to deter poachers. I had heard about this development but had not yet seen them. I was full of emotion—and horror—that poaching had such a devastating effect. It must have been a hard decision to dehorn their rhinos, and I am grateful for the reserve’s efforts. José Naranja creates beautifully detailed sketchbooks by collaging elements of photography, writing, stamps, and his own precise drawings of everything from poison mushrooms to a bird’s eye view of his dream studio. 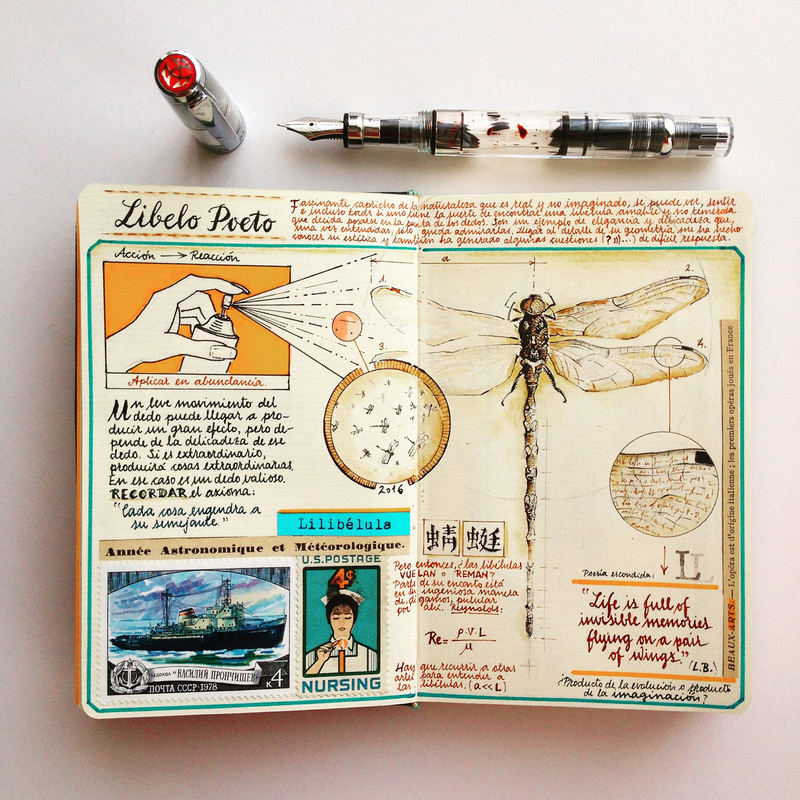 The ex-aeronautic engineer began working with sketchbooks after he discovered pocket-size Moleskine notebooks in 2005 and realized they were the perfect vessel to document his daily experiences and develop his wildest ideas. After 13 years of using the same style of notebook, Naranja now crafts his own by hand. The sketchbook artist also sells edited copies of his best work in a compilation called The Orange Manuscript, which you can find on his website. You can see up-to-date sketches and follow his travels (which happen nearly year-round) on his Instagram.